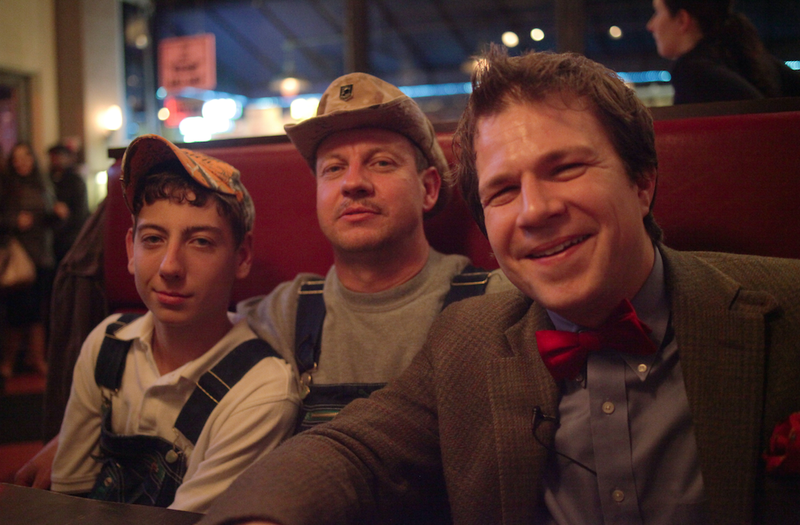 BourbonBlog.com‘s Tom Fischer catches up with moonshiner Tim Smith and J.T. in New York for an update to learn about season 2 of Moonshiners, and what else is new with them since the end of Moonshiners season 1 on Discovery Channel? For the latest on Moonshiners Season 2, subscribe to our mailing list here and we will send you the news first as the new season moves along. We take Tim, his son J.T. and Tim’s wife Shelby out to dinner at Blue Smoke BBQ and Jazz Standard where we’re greeted by Executive Chef & Pitmaster Kenny Callaghan. For all you Moonshiners fans, we invite you to visit Tim Smith’s Moonshiners Store, where you can buy a variety of Moonshiners branded flasks, t-shirts, autographed photos, and the folding moonshine cup that you see Tom using in the video above. BourbonBlog.com first brought you our original interview with Tim Smith as a podcast on this link in December 2011 as an exclusive first look during the premiere week of the show. Moonshiners was based in Climax, Virgina where Tim and his partner Tickle begin season 1 by finding the right spot for their moonshining operation. Throughout the six episode season one, ABC agent Jesse Tate is on the hunt for moonshiners running illegal activities, but never catches up with Tim. Archived footage of Marvin “Popcorn” Sutton is also included in each episode which eventually tells the story of Popcorn’s death. Season 1 of Moonshiners ends with Tim Smith jumping on a jet to meet with investors so he can start his own legal moonshine distillery or brand. Tim tells BourbonBlog.com in this new interview that he is still evaluating many options and offers for his dream to come true. Video filmed and edited by Oresti Tsonopoulos. Photo above also by Oresti. I loved the show!! Me, my husband, and our two small children watched it religously!! Its original, different on a illegal subject no less. Aboslutely addicting. Whenever my 4 yr. old son see’s water in a pond or a ditch he’ll say “Mom that looks like good water to make moonshine!” lol I laugh but he has no idea what “moonshine” actually is so its okay. I hope there is a season 2 i cant wait to see Tim & Tickle again!! Love you guys! I really enjoyed the show it brings back memories of my Father and the stories he told us of the time when he made Moonshine to help provide for his family. I remember a time when we were going with him to make a delivery some where in Oakboro ,NC and we got pulled over by a Highway Patrol-man after crossing low water bridge between Aquadale and Oakboro and the officer shine his light inside the car and all us kids were sitting on the case of mason jars filled with moonshine and he let us go. I just want to say thank you for bring back those memories of my Father. When is your next show coming on again. Season 2 starts this fall. This show is 100% BS! These guys don’t know the first thing about making whiskey! I find the show very entertaining and a blast to watch! When is the news show starting can’t wait, Love the show.